The image of a local mom and pop shop always brings a smile to my face. Seriously, who doesn’t love local storefronts? If you’re anything like me, you have each tiny store located in your hometown engraved into your brain. If one disappears, you’re shocked! “Chuck’s Cupcakes closed?! How could they do that?” we find our adult selves whining to our unfazed parents. Living in downtown Boston and commuting to work on foot, through one of the main shopping strips in the city, I tend to stay pretty up-to-date on new store openings. But not everyone has this benefit. Many people commute to work on freeways, without ever getting a glimpse of new store openings. Of course, there are streets and locations in close proximity to my apartment where I never venture, so I’d never stumble across those businesses UNLESS I happen to find them online. Perhaps I read an article on Bostinno, one of Boston’s local news sites, or (the more likely scenario) I find the storefront on Google. This is one of the many reasons all local businesses need a strategy to appear in Google’s search results. What if your online presence is weak or nonexistent? If you’re a local business and you are not easily found on Google, that is an issue in and of itself! But it’s a widespread one. Many local business owners are not tech-savvy, not invested in online advertising, and hold the belief that the storefront itself will attract business. Well, if you’re in a prime location this might be true, but your business will skyrocket if you expand to advertising online. From restaurants, boutiques, repair stores, beauty shops – all of these brick and mortar business should be leveraging online advertising. Google’s trying to address this issue with their new initiative called “Let’s Put Our Cities on the Map,” with the goal of helping 30,000 cities get their local businesses online. If you fit into the mold I described above, I definitely recommend signing up for this program. “This tailor-made program provides each city with a custom website where local businesses can find helpful resources, including new diagnostic tool that shows businesses how they appear on Search and Maps, a step-by-step guide for getting online with Google My Business, and a free website and domain name for one year with our partner, Startlogic,” says Google. Did I mention it’s free? Perhaps you’re already advertising on Google, but if you’re looking for ways to getting more online visibility and store visitors, follow these four tips to get more business to your storefront through Google. 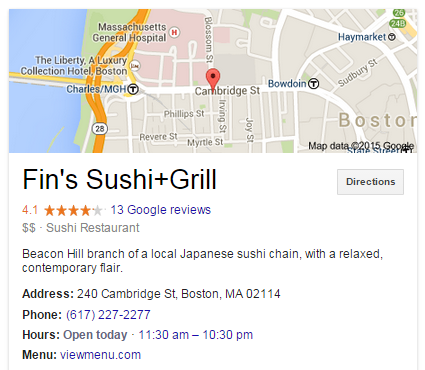 Google My Business allows searchers to easily find information about your business on search, maps, and Google+. It’s free, easy to manage, and gives you the control to present your local business in the best light possible. 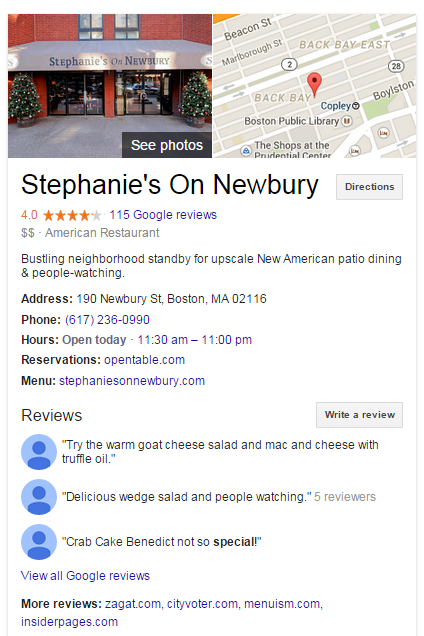 Check out the example below of a local Boston restaurant which clearly maintains their Google My Business Account with photos, contact information, reviews, and an intriguing line of text to describe the cuisine and vibe of the restaurant. Comparing Fin’s Sushi below, it’s clear that Fin’s isn’t giving their business the same love at Stephanie’s (although their sushi is delicious). AdWords may or may not be part of your advertising strategy, but for local businesses the opportunity to reach more leads through paid search is huge. Let’s say you’re looking for a home improvement store, so you type “home improvement shops” into Google, you’re then greeted by several ads. If your store front is not on the list, you just lost a potential customer. 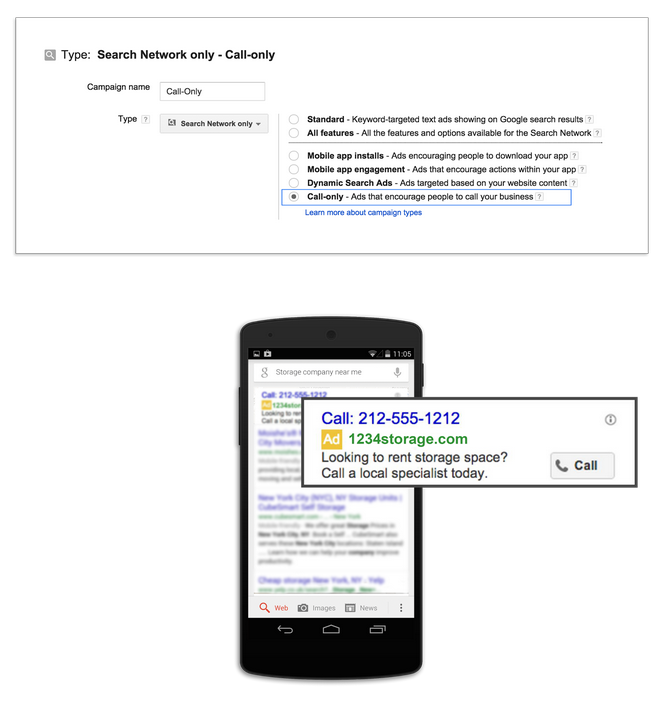 If you are advertising or you’re looking to get started a good place to start is with one of Google’s newest features, Call-Only Campaigns. For local storefronts, phone calls are a huge part of the business, whether you’re running a restaurant and customers call in to make reservations or you sell clothing and a potential customers calls for store hours or to check if you have the style and size they’re looking for. And data backs this up, with 70% of mobile searches calling a business directly from search results, according to Google. Of course, there are still those desktop searchers who will visit your site to obtain information. This means that calls will also be important in your AdWords conversions occurring through landing page visits, but the problem is they can be challenging to track – the ROI of your campaigns is misrepresented, making it challenging to evaluate the effectiveness of your AdWords spend. 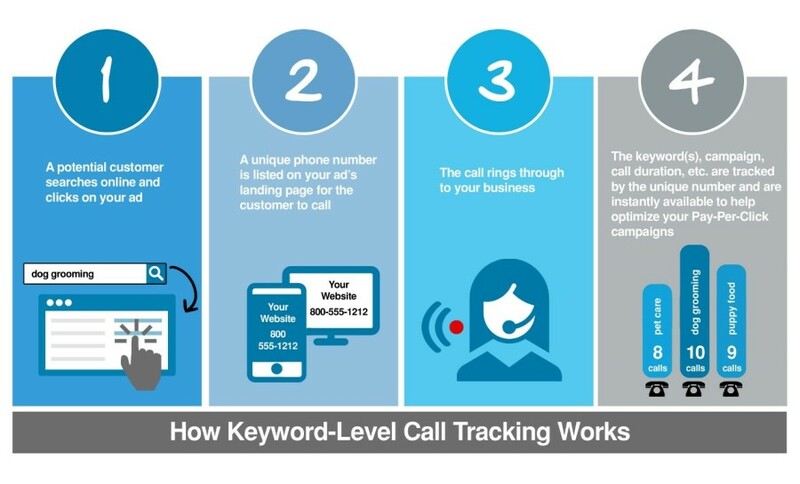 Luckily, WordStream has an awesome call-tracking feature to track the numbers and names of the phone calls, the calls’ duration and whether or not conversions occurred, record calls, and attribute the calls down to the campaigns, ad groups, keywords, and even match types that the calls occurred from. This closes the loop so you can not only drive more calls, but know which ads led to calls that resulted in sales or closed deals. When your storefront is the main place that conversions occur, the main goal of your AdWords campaigns is to drive traffic to your store. In addition to call information, listing your address is beyond important. Utilize all relevant ad extensions in AdWords to not only extend the presence of your ad in the SERPs, but also to get your leads motivated to visit since they have you location and phone number at their fingertips. Other ad extensions I’d recommend taking advantage of include sitelink and callout extensions to highlight special offers and discounts going on in your store, and to link to other important pages on your site (like your contact us page!). To add location extensions, you will need to quickly link your Google My Business account to your AdWords account, if it’s not already (you’ll be prompted to do so within AdWords when attempting to add the extension). This tip might seem like common sense, but you’d be surprised at how many accounts I’ve seen that are targeting either an area way too big or way too small. You need a happy medium, especially with a brick and mortar business because customers are only going to travel so far to buy your products. Luckily, there are several ways to target your storefront, and if you have multiple storefronts you can duplicate your campaigns, make location specific changes to ad text and keywords, and target different locations separately. Take time to consider the traffic that comes into your store and your competition in the area. For example, if you sell in a rural town with a downtown strip of shops, you might be able to target neighboring towns without downtown areas to shop at, but you likely want to avoid the closest city since city livers (and those in a nearby radius) will probably shop in close proximity to their location. 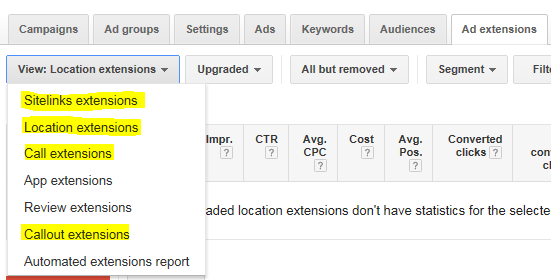 Within AdWords, select each campaign, then go to the “Settings” tab, then “Locations.” Within locations you can target by city, region, or postal card, or get even more granular by clicking “Advanced Search,” and targeting by a specific radius. 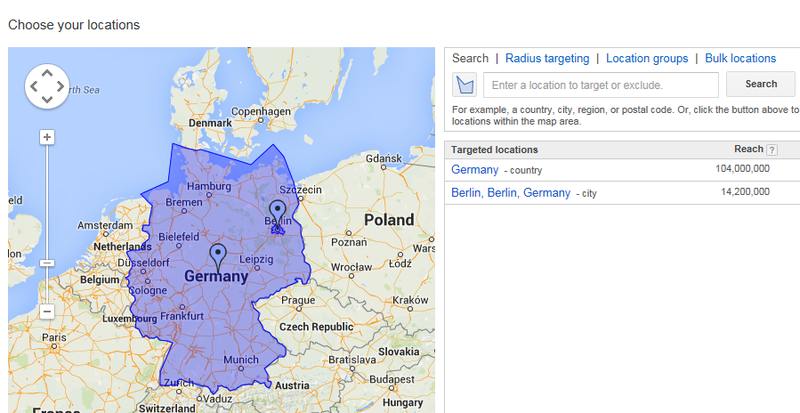 So storefront owners, I encourage you to stop underestimating the power of Google! 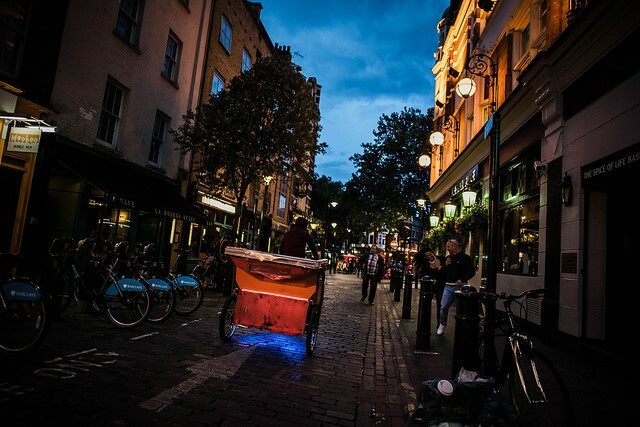 I know you likely opened your store to avoid the internet, but guess what – it’s unavoidable! If you start effectively advertising on Google and utilizing free tools like Google My Business you’ll likely see a huge increase of foot traffic into your local storefront.